In a ceremony awash with tradition, color and splendor, Elizabeth Davis, Ph.D., was installed as Furman University’s 12th President March 19 in McAlister Auditorium. Themes of renewal, tradition and community echoed throughout the cavernous 1,850-seat auditorium that was brimming with special guests, trustees, alumni and members of the University community. The event also featured the premiere of “Gloriana,” a work by Jay Bocook ’75 that was commissioned for the special occasion. The gray, cloudy skies of an early spring storm did not dampen the spirits or mood of the capacity crowd as rousing works by Johann Sebastian Bach and Henry Purcell welcomed lengthy processions of alumni and regalia-clad faculty. In all, 14 participants – faculty members, students, trustees and local dignitaries – took to the podium to extend greetings to President Davis, her husband, Charles, and children Chad and Claire. Among them were Traveler’s Rest Mayor Wayne McCall who called Dr. Davis “an uncommon leader with a common touch” and Greenville Mayor Knox White, who discussed the 160-year history that binds the “mountain city” and Furman. Richard Cullen ’71, past chair of the Board of Trustees, presented the President with Furman’s Charter, while Carl Kohrt ’65, Ph.D., who served as interim president from 2013 to 2014, placed the Presidential Medallion on Dr. Davis. In keeping with university tradition, the senior member of the faculty (William Brantley, Ph.D.) presented President Davis with the University Mace. Hill Jr. ’83 delivered the Oath of Office. 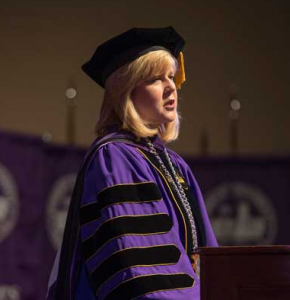 “This day is about Furman and the many lives it touches, its historic role in American higher education, and its dedication to serving the world at large through what has been our greatest hope for progress: the education of the mind, and the enrichment of the spirit,” she said. Davis said it was a day to renew Furman’s commitment to the qualities that have allowed it to prosper for nearly 200 years—courage, creativity, compassion and community.